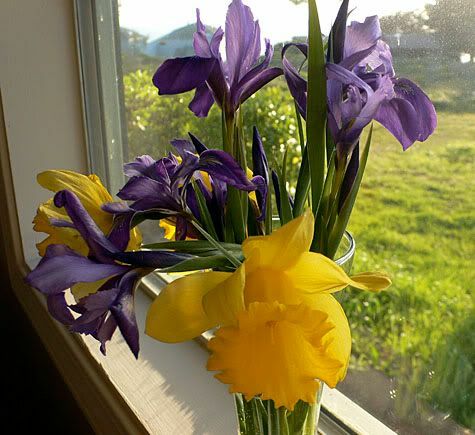 These are some of the beautiful irises and daffodils that CDR cut from the yard. We woke up to the sound of the surf and the smell of coffee. It was so lovely to walk out to that gorgeous view, pet happy dogs, and have a nice hot cup of fresh brewed coffee. In no time, we jammed into the cozy, cramped kitchen, the four of us, Mank, CDR, Mr. K and I wove our way around the stove in a complex negotiation of time on the burner or getting into the oven. It was a lot of fun and we ended up with quite a feast. As usual when cooking, I neglected to photograph half of it… but the food disappeared before I could get my camera ready and I admit that I was mesmerized by my own plate of delicious food. 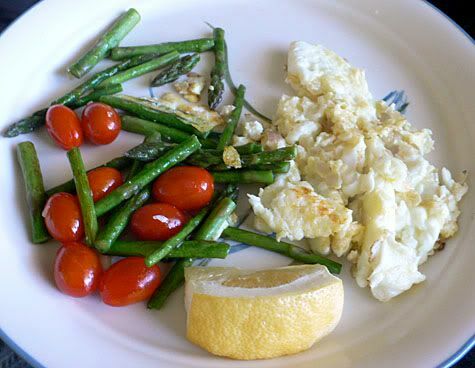 This is Harriett’s plate of scrambled egg whites, with sauteed asparagus and cherry tomatos. 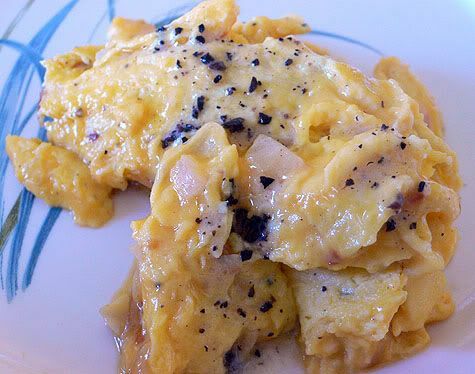 The extra egg yolks went into the general pool of remaining eggs, which we topped with most of the remaining black truffle butter. Decadent and very aromatic. 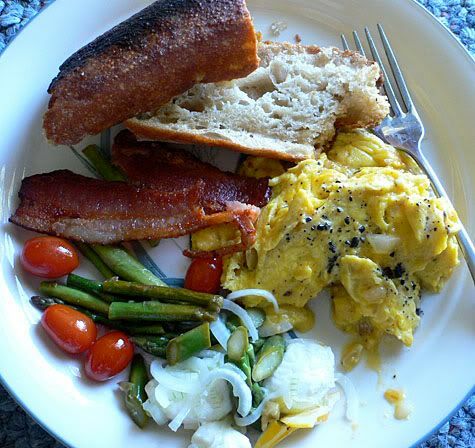 This is my very demure plate of various delicious things: toasted baguette with lots of butter, truffle buttered eggs cooked to creamy perfection by Mank, crispy bacon, asparagus and a small pile of boconcini (fresh mozzarella balls) with meyer lemon, spring onions and steamed asparagus. Those cherry tomatos were the best thing on the plate, they were sweet and the skin was super tender, exploding in your mouth in a sunny burst of summer.